The land was donated by William Penn in 1693 as a burial ground for members of the Religious Society of Friends, or Quakers. 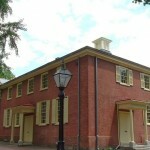 The meetinghouse was designed by Own Biddle and built between 1803 and 1805 atop the graveyard. 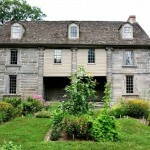 Bartram’s Garden is the pastoral 18th century homestead of John Bartram, a Quaker farmer. With views of Center City Philadelphia, the garden features meadows, wetlands, a river trail, archeological artifacts, and farm buildings. 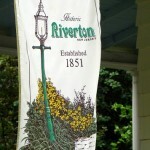 Riverton was the first entirely planned residential subdivision in America, laid out in 1851 by Philadelphia architect Samuel Sloan. Bristol’s first European settler, Samuel Clift, operated a ferry across the Delaware River in 1681. By 1697, the town of Bristol was created. The historic district has over 300 buildings, including the early 18th century Bristol Friends Meetinghouse. 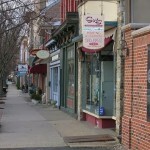 One of New Jersey’s most historic towns, Burlington was first incorporated in 1693. 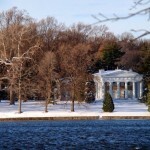 Today the historic district, bounded by the Delaware River and High, West Broad, Albot, and Reed Sreets, is known for its significant architecture, including structures by Richard Upjohn and William Strickland. 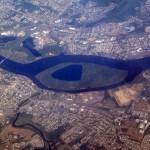 Burlington Island is a scenic and uninhabited island in the Delaware River. 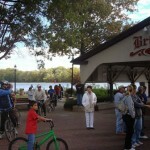 A noteworthy feature is the large lake-within-an-island-within-a-river. First settled In 1624, it is the site of the first European settlement in what would become New Jersey. In the late 19th and early 20th Centuries, the island was used as an amusument park. Calhoun Street Toll Supported Bridge a historic bridge connecting Trenton, NJ to Morrisville, PA. 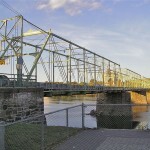 The bridge was constructed by the Phoenix Bridge Company of Phoenixville in 1884. Built 1770-1774, this meeting hall was built by the Carpenters’ Company of Philadelphia, the country’s oldest extant trade guild. 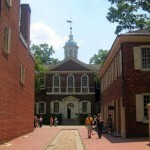 It also was the location for the First Continental Congress in 1774.